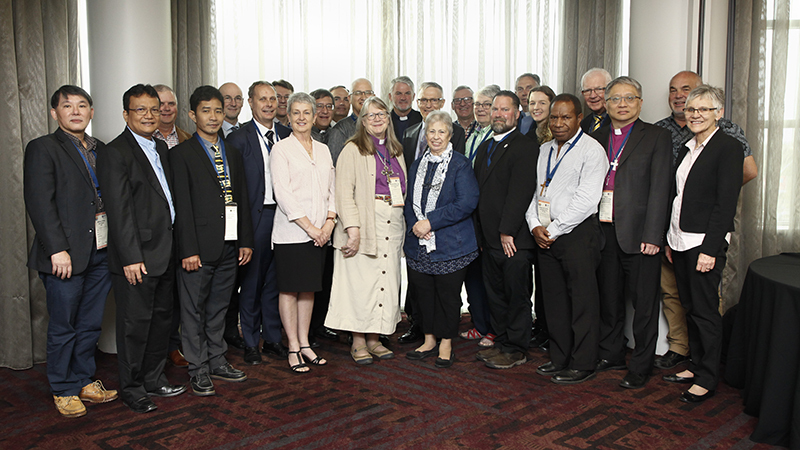 The strong contingent of international guests to the LCA’s 19th General Convention of Synod reflects the diverse partnerships we have with Lutheran churches and bodies in other places. Seven international representatives joined delegates and visitors in worship and in the business centre, learning about and observing the synod in action. Three guests brought official greetings: Bishop of the Evangelical Lutheran Church-Papua New Guinea Jack Urame (Tuesday), Lutheran World Federation representative Bishop Ben Chun Wa Chang (Wednesday) and International Lutheran Council representative Albert Collver (Thursday). The other four guests were Rev Dr Paul Munthe (Gereja Kristen Protestan Simalungun Indonesia), Bishop Daniel Orn (Lutheran Church of Cambodia), Rev Dr Franklin Ishida (Evangelical Lutheran Church in America) and Bishop Jessica Crist (Evangelical Lutheran Church in America). 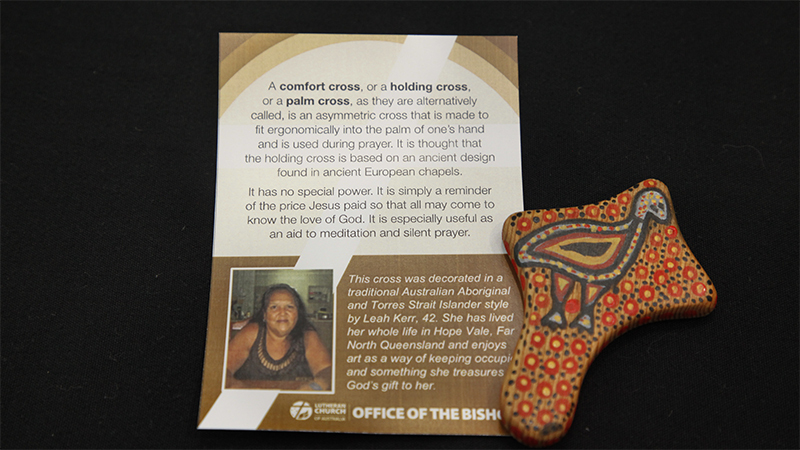 As mementoes of their visit – made even more significant in light of Synod’s decision to develop a Reconciliation Action Plan – the guests were given a decorated cross. The crosses, variously called comfort, holding or palm crosses, were made by South Australian resident Ian Pfeiffer and individually decorated by Queensland artist Leah Kerr. Comfort crosses are asymmetrically shaped to fit into the palm of the hand and based on an ancient design found in European chapels. They are used as an aid to meditation and prayer and reminder of Christ’s work of salvation on the cross. A carpenter-builder, Ian has been making comfort crosses since his retirement in Adelaide. Leah, who has lived in Hope Vale all her life, took up painting more than 10 years ago. Her work is based on traditional Aboriginal and Torres Strait Islander designs but she enjoys using a brighter palette of sea colours which she draws from her Far North Queensland coastal environment. She began painting as a way of managing chronic pain caused by a significant childhood injury and describes her talent as something to be treasured as ‘God’s gift to her’.